Traveling Massage Therapist Project. Massage, body work offerts, presentation, workshops and training. Traveling Massage Therapist Project. Piotr Szczotka massage therapist and trainer, publisher, author of few books and many articles promoting: health, massage and body work. Workshop and trainings available also in your country. d) Massage application in aesthetic medicine, reconstructive and plastic surgery. Human worker based on Integration Body Work Massage conception in psychosomatic revitalisation, working with people in deep strees, chronic tension and aversion to touch after trauma. The role of touch in therapy and in interpersonal communication. Trauma and the problems with acceptance. Massage supporting psychosomatic revival and plastic surgery. Moving towards practice to respond to real needs and human tragedies. but can we rate which side of the injury, trauma and treatment is more difficult? Massage with elements of body work in psychosomatic revitalisation. A) Integrating Body Work Massage – in psychosomatic revitalisation. Piotr Szczotka concept. c) DMA Dynamic Antycellulit Massage concept. C) Emotional Face – relaxing and lifting. Information about workshops, training for therapist, qualified masseurs, physiotherapists or cosmeticians after additional massage courses, or students, also available for visual impairs therapists. Professional massage and aestehetic medicine and plastic surgery. Journal of Australian Association of Massage Therapists. Summer 2006. Integrating Body Work Massage is one of the comprehensive session of the deep relaxing, preventive treatment, with the elements of therapeutic massage, applied in psychosomatic revitalization. Modified western techniques and elements of specific passive, flexible but minimal gymnastics are used in a breathing phase. The main focus from the physical aspect is put on working with soft tissue, connective tissue. Moreover, there are applied such is techniques as manipulation of the soft tissue in a movement phase. Additional diagnostic elements are included during the initial relaxation. The rhythm of session and the synchronization with breathing is of high importance too. Besides, is one of the most interesting form of passive relaxation and preventive treatment. In spite of applying soft techniques this massage affected very deeply. During the initial relaxation and the work with alleged defensive contractures, for example in the segment of the chest, thighs, shoulders, angle of mandible, forehead, we also try to understand a patient’s subjective disturbances and also subtle senses. Sometimes we use gravitational force, only this, without stronger techniques, working for example with contractures in shoulders. A greatest art is feeling out of most subtle patient's reactions, and not these which are self-evident, foreseeable, brought to light, objectively examined. I am convinced that, everything takes its time and has, a proper aim and the direction, so techniques unaccepted by the patient, cannot help him in trauma. I think that fundamental of the success is also conscious massage, working with soft tissue, but not only patient slept through the session. A wide knowledge of the influence of massage and body work, diagnosis and many different techniques let us describe comprehensively all structural changes in tissues caused not only by physical factors, injuries, problems of metabolism, but also through the deep stress, emotional and psychosomatic independencies. In IMBW – we working softly but deeply, painlessly and in layers. This is not only deep relaxing or therapeutic session, but outreaching experiences. The session takes place in friendly, safety conditions with keeping the principles of the professional relaxation massage. It is made in rather long session – reaching about 60 75 minutes – more effective not only as one session, but in series of several sessions. During the session the patient is lying comfortably on a professional massage table or on mat.If it is necessary, a such situation, is able to optionally to give a session through the clothes. Also as a whole body treatment or a part, sometimes this is depends of the nature of trauma. 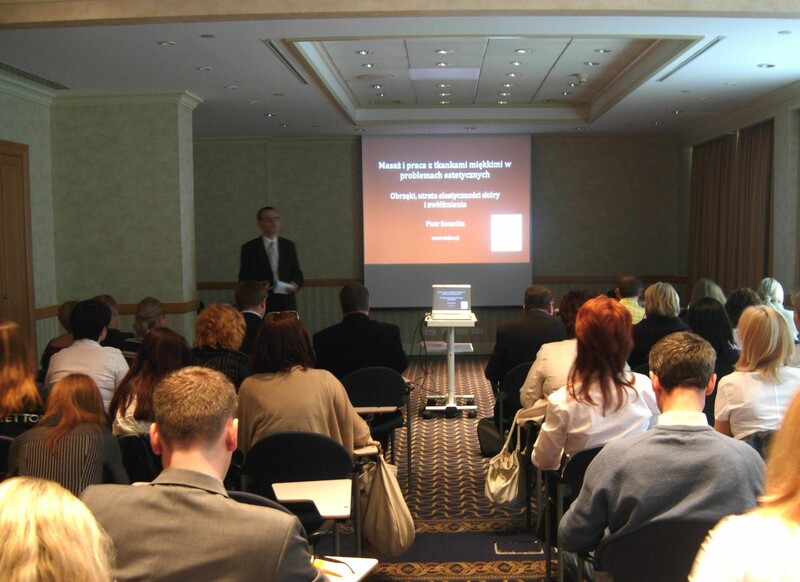 IMBW Piotr Szczotka concept, presentation, workshops and training available in yours country. Workshops are dedicated for massage therapist, physiotherapists, osteopathy, social workers and psychotherapist with additional massage courses. Declarations of the customers coming to massage offices are simple, pragmatic. There want to be more slim, more shapely, to decrease cellulite. So most often declare their own expectations, but whether a main problem is exactly cellulite? Perhaps it is a local accumulation of the adipose tissue? Maybe pseudo cellulite or real overweight? The flaccidity of the skin whether perhaps swellings? And, if we can see additional problems with weak blood vessels or fibrosis? Every form of mentioned problems can coexist with other, however they demand diagnostics, settlements of priorities in the therapy and differentiations of the treatments. In cellulite changes, one of basic methods practical both in the diagnostics and the treatment with the confirmed effectivity is massage. It is also refer to prophylaxis, because cellulite changes have the progressive character. So we not only attend it, but we hold back this changes. Universally we call cellulite as aesthetical defect or popularly „an effect of the orange peel”, this are however distant qualifications from the medical knowledge. There also arouse many controversies. Cellulit changes are defined as a health-aesthetical progressive problem. One of the proper medical term of cellulit - (PEFS the term proposed by physicians, specialists in aesthetic medicine, especially in European literature, means paniculopatia edema -fibro-sclerotica). So we should think about cellulite like about illness with progressive character. This is not only aesthetic problem appearances without reasons. Is it, so? Originally we can see changes like a micro-edema, but cureless it cause secondary changes in the subcutaneous tissue in the form like a fibrosis, later indurations and even painful nodes. It does not mean that every woman with cellulite has so far developed changes, but for example sudden occurring changes in the skin condition can be result of other ailments. Technical information. The massage under treatment of such changes is very diverse, from the manual drainage, the connective tissue massage accompanying, through optional authoring solutions. © The Dynamic Massage Anti-cellulite is one of them. His practice demands the very big precision, focus, the acquaintance of the soft tissues work and displacement to the stratified work without forced. This is real test of focus and stratified work. The qualification “dynamic” is connected with the differentiation of the amplitude and the frequency of impulses, optional techniques and body positions, but not the forced massage. Once we use technique of special stroke, rubbing and the pressure in the stabilized or we led cutaneal fold, for example in the local area. However, if we have problems with the flaccidity of the skin, we use the technique with the subgrasp or with the parallel, led fold. Lots of patients have diagnosed also coexisting problems with lymphatic or the first venous insufficiency. Sometimes appearing swellings in conditioned regions. We work softly but deeply, painlessly but in layers. We focus on soft tissue massage and fascia, but sometimes in the beginning we must focus on problems how to relax the whole body, especially if patients have problems with body acceptance. if somebody tolerates the massage, it does not mean that there are no problems with the touch averseness. Such as phases can be during the revitalization after childbearing. Part 2. Massage application and procedures before and after some plastic reconstructive surgery and body shaping. Massage is present not only after liposuction or cosmetic surgery, skin and breast correction. Sometimes we work with old scars from burns, sometimes we focus on treatment of the injuries, this is part of the aesthetic medicine and reconstructive surgery. The book: „The Dynamic Anti-cellulite Massage - the massage in the cellulite therapy and the body shaping” shows as large meaning and the efficiency has a therapeutic massage in the cellulite therapy, body shaping or local problems with adipose tissue accumulation, also revitalization after the childbirth. a. The clinical application of therapeutic massage in the aesthetical medicine and reconstructive, plastic surgery. b. Dynamic Anti-cellulite Massage and local accumulation of adipose tissue. C. Integrating Body Work Massage in psychosomatic revitalization, concept by Piotr Szczotka. Information about workshops, training for therapist, qualified masseurs, physiotherapists or cosmeticians after additional massage courses, also available for visual impairs therapists. Piotr Szczotka workshop available in Poland or in your country! 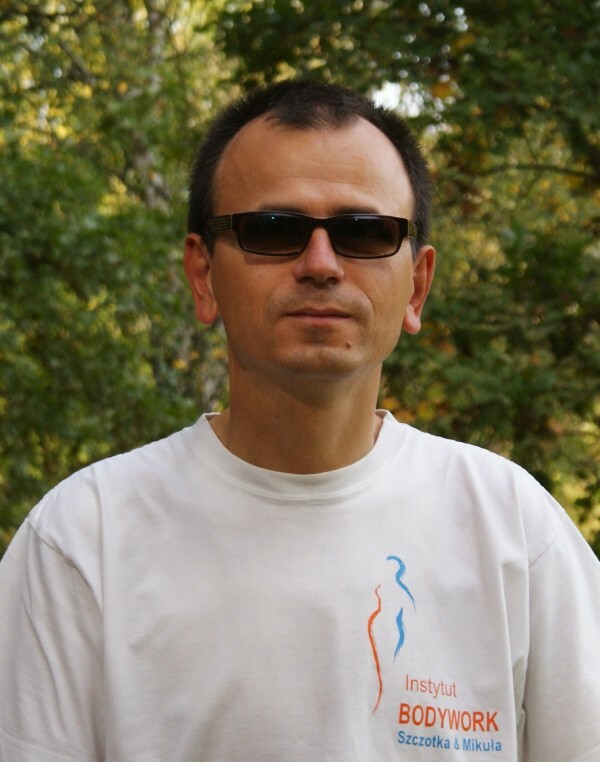 Piotr Szczotka therapeutic massage technician in Poland and in USA, health promotion specialist b.a. massage teacher, publicist, lecturer on many congresses, fairs. The author of many articles and a few books about massage. Promotes therapeutic massage and work with soft tissues in the psychosomatic revitalization programs. 1. 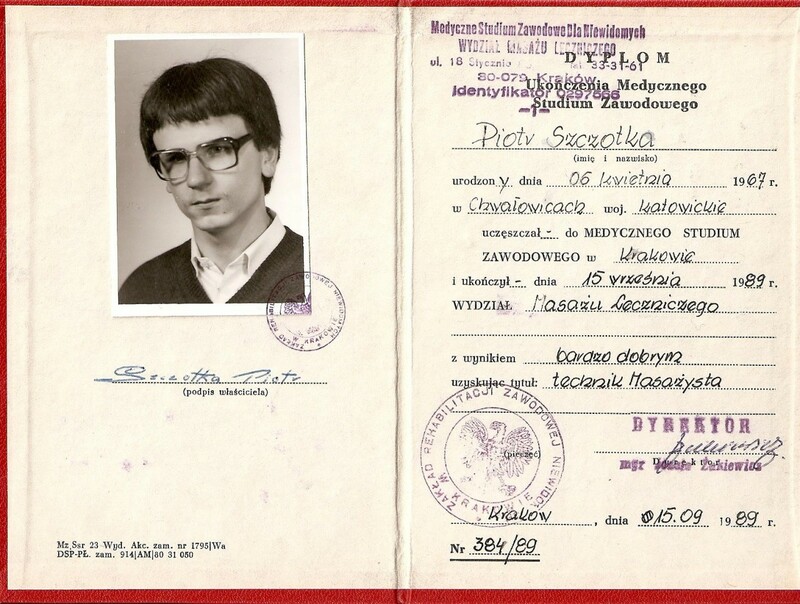 Medical Professional School Department of Therapeutic Massage (for Visually Impaired) in Kraków - syllabus 2500 h, in 1989. 2. 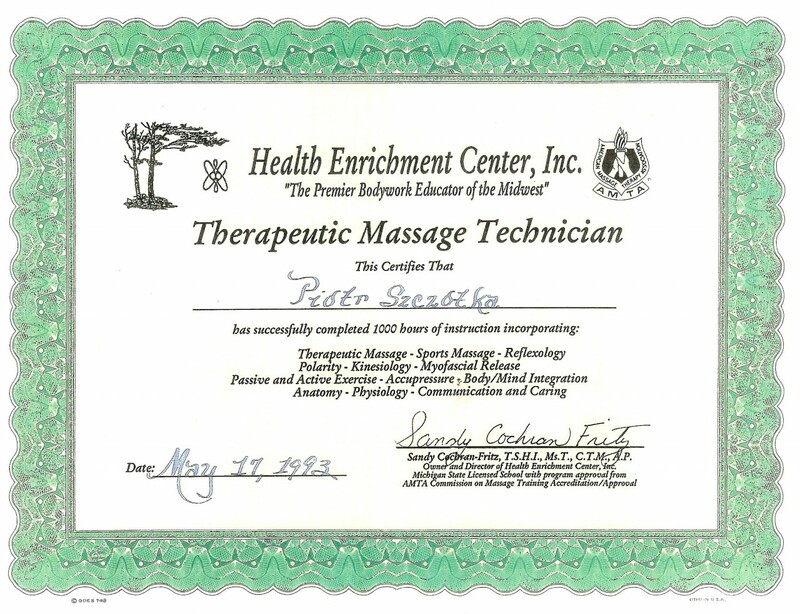 Health Enrichment Center, the Sandy Fritz School of Therapeutic Massage MI, USA - syllabus 1000 hours, in 1993. 3. Polish College of Theology and Humanities, Health Promotion bachelor of art 2010. 4. Postgraduated Studies at the SWPS University Department of Psychosomatics and Somatopsychology. Poznań 2015. Stanley Rosenberg Institute - Connective Tissue release. Corso di Drenaggio Linfatico Manuale by R. Bartoletii. Training face lifting 3 D by dr Hidemi Morimasa. The activity during congresses, presentations, trade fair, performances. In years 1993-95 worked out a method of massage and author training: Integrating Body Work Massage Piotr Szczotka conception (therapeutic relaxing, anti-stress massage, application in psychosomatic revitalisation) and Dynamic Anti-cellulite Massage. In years 1998, 2002, 2004 co-organizer of the first Educational Fair of Massage. In the previous years the board of Masseur Associations in Poland. Founder of I and II Bodywork Conference. 1. Modern Massage - therapy, prophylaxis, relaxation. 2. Integrating Massage Bodywork - massage in biological and psychosomatic revitalizations. 3. Face massage in aesthetic medicine and plastic surgery”. 4. Dynamic Anti-cellulit Massage - massage in cellulite therapy and body shaping”. 5. Professional practice. Massage office and passion of life. Polish editions. Practice in my office, hotel, and in companies. Relaxation, prevention, treatment. Promoting health mainly apply: therapeutic classic (swidish) massage, myofascial release, manual lymph drainage, segmentary massage T.P. reflexology, etc. In prevention, stress problems and relaxing massage, authoring program: Touch and space, Szczotka: Integrating Body Work Massage and Emotional Face. Additionally - Massage in workplace program for firms and company with element of health promotion. 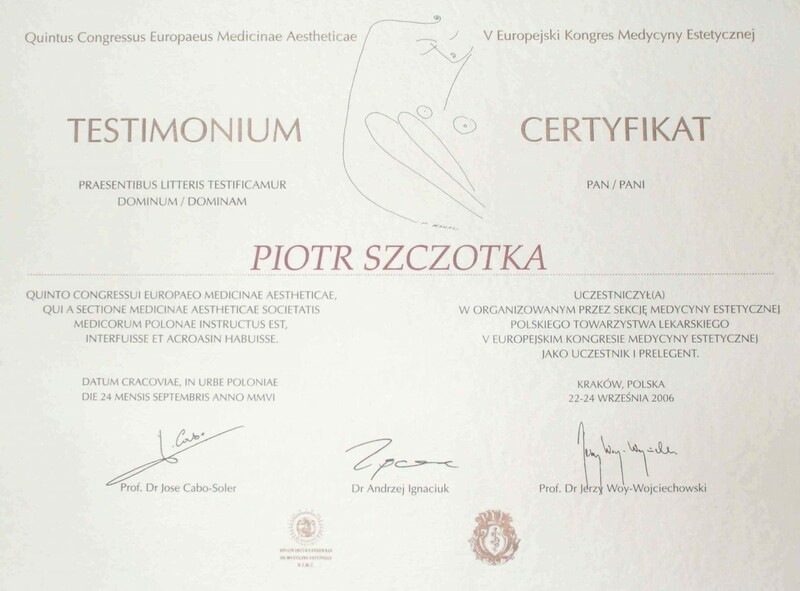 In beauty and aesthetic massage: authoring program Piotr Szczotka Dynamic Anti-cellulite Massage (also body shaping) in Piotr Szczotka concept. Skin Revitalization Massage before and after aesthetic medicine procedures. I apply massage in Massage Room, patient home, but also in firms and companies. Issues of massage: therapeutic massage, relaxing massage, massage and soft tissue work in psychosomatic revitalisation, sport massage, beauty massage, body shaping massage, massage during maternity, cellulite therapy, massage in aesthetic medicine and after plastic surgery. Also presentations on fairs and medical, spa, massage, congreses.